Manuvikasa is among the few non-governmental organizations working towards overall development in Karnataka state through its diverse objectives. ‘Social Transformation’ is the motto of Manuvikasa. Social issues addressed by Manuvikasa include education for under privileged children, protection of human rights, women’s empowerment and conservation of natural resources. To bring about positive changes in these areas, the young and dynamic team at Manuvikasa initiated various programmes. Some of these initiatives include forming more than 85 Self Help Groups (SHGs) for rural women in a short span of four years; encouraging poor and orphan children to pursue elementary studies by providing education support, supplying basic study materials and by way of scholarships. To address scarcity of water, Manuvikasa built 74+ water tanks with unstinted support from localities and other state bodies. It also promoted ‘kitchen gardens’ to enable farmers to grow chemical free crops. The organization is committed to develop sustainable livelihood, improve the education system, enrich the environment and inculcate good human values among people residing in Uttara Kannada and Haveri districts of Karnataka state. 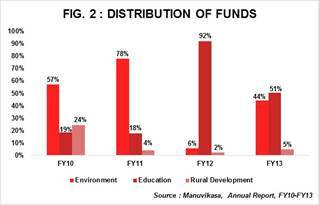 Manuvikasa recorded an impressive y-o-y income growth rate of 70% in FY13; total income of Rs2.2mn as against Rs1.3mn in FY12. The smart growth in FY13 can be attributed to donations received from a single large foreign donor which accounted for 52% of total income i.e. Rs1.1mn; followed by Individual donations (29%) (Refer Fig. 1). There has been a big change in income sources in FY13. 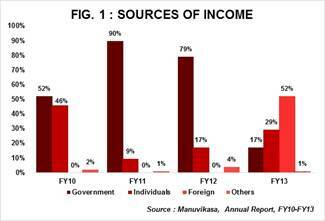 Foreign income was nil until FY13, but has now become the largest source; whereas income from Government sources accounted for between 50-90% of income during FY10-FY12 but has fallen to 17% in FY13. (Refer Fig. 1). Among other sources, Individual donations are also collected from localities in cash to partially fund construction of water tanks/kitchen gardens (self-owned) which accounts for nearly 40% of the total individual donations in FY13. About 75 water tanks were built in FY13. Funds raised are distributed among 3 well defined objects of the trust – Environment, Education and Rural/Livelihood Development. The significant y-o-y variations in spending across different objects (Refer Fig. 2) remain a concern. However, organization sources highlight that this is because the funds are allocated based on community requirements and the donors support to a specific cause. 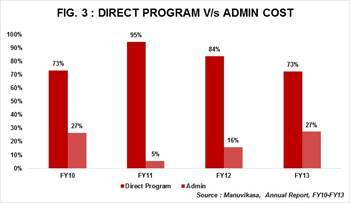 Manuvikasa incurred high administration costs in FY13 (Refer Fig. 3). This was on account of expenses incurred towards scaling up its in-house team as well as office space. Two new offices were taken on lease with the objective of conducting various awareness programs/workshops in-house. Staff members increased from 5 to 14 in FY13. Fund raising related activities were solely handled by the Trustees. During FY13, Trustees were compensated for their time and efforts and paid salaries unlike in the previous years; resulting in an increase in professional fees and staff related costs. The organization has made no investments in liquid assets over past 3 years; thus resulting in higher cash & bank balances which forms about 89% of total current assets (Rs276,000) in FY13. 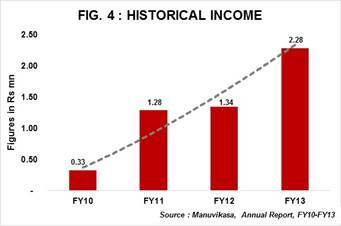 Manuvikasa posted income growth of 91% CAGR for the period FY10-FY13 (Refer Fig. 4). Marginal improvement in self-sufficiency ratio from 0.2x in FY12 to 0.3x in FY13 (Self-sufficiency ratio measures how much of expenses can be met from own income – individual donations/corpus income/fee income). Donations are received regularly from a few committed donors which include local residents and donors through Give India and Give to Asia. Donations from government sources have been irregular in nature over past four years. Committed donors include LIC, Karnataka Rajya Vijnana Parishat, Department of Public Instruction (Education), Minor Irrigation Department. The Deshpande Foundation tops the list of donors with its contribution of Rs1.1mn (52% of total income in FY13). The Foundation has committed to donate approximately Rs3mn in FY14; out of which ~Rs1.5mn has already been received by Manuvikasa (as on Oct 2013). Retaining qualified and committed human resources. Manuvikasa has an active Advisory Committee comprising of qualified professionals from all walks of life. Manuvikasa is accredited by Credibility Alliance and is listed with Give India.